Backed by Bushmans Tanks ’ more than 20 years experience in the field, the Bushmans range of large water collection tanks have stood the test of time as they are manufactured to the highest quality standards. 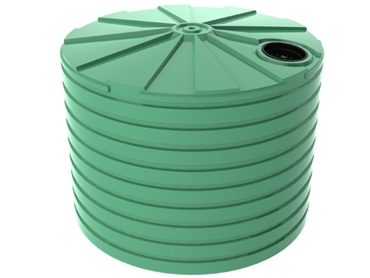 The 10000L Round Squat tanks provide excellent rain water storage capacity, being suited to large town blocks or rural properties.Height: 1.48m;Diameter: 3.05m;Total Height: 1.70m. The 10000L rain water tanks have a smaller diameter footprint with extra overall height. These tanks feature excellent storage capacity, and are suited to large town blocks or rural properties. Height: 2.16m;Diameter: 2.59m;Total Height: 2.31m. The 15000L rain water tanks are suited to large town blocks or rural properties and could offer water independence.Height: 2.20m;Diameter: 3.05m;Total Height: 2.44m. The 22500L Round water tanks are well suited to rural properties or large town blocks where extra water storage is desired, but diameter space must be minimised. Height: 2.12m;Diameter: 3.73m;Total Height: 2.44m. The 30000L water tanks are suited to rural properties which require plenty of water storage.Height: 2.68m;Diameter: 3.92m;Total Height: 2.87m. This 46400L water tanks are ideal for rural properties that required the highest water storage capacity and the most efficient space utilisation.Height: 2.95m;Diameter: 4.60m;Total Height: 3.16m.